All roads led to Clennell Hall last Friday for our Chapter weekend away. People had taken a variety of routes to get there and tent pitching and checking in was underway throughout the afternoon. There was a mix of weather too, with some people getting soaked and some missing it altogether. As expected, everyone had a tale to tell as we landed in the bar to swap travelling stories. 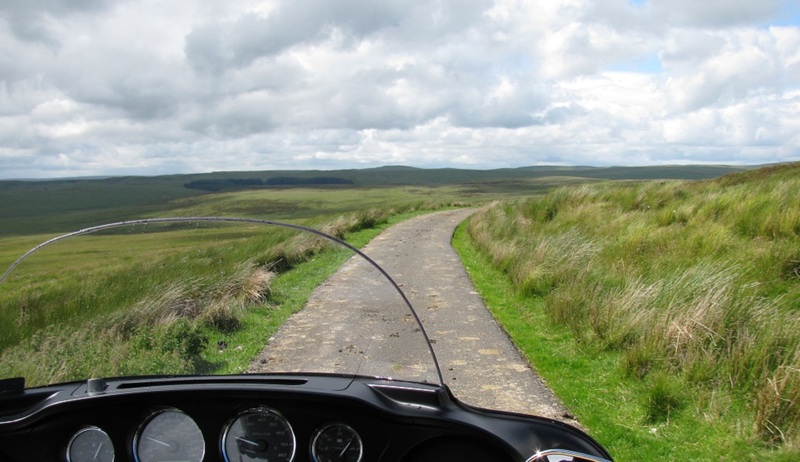 We had a very circuitous route there via Morpeth, Bolam Lake, Otterburn, Otterburn Ranges, Blindburn and Shillmoor before landing into Alwinton. A great trip! 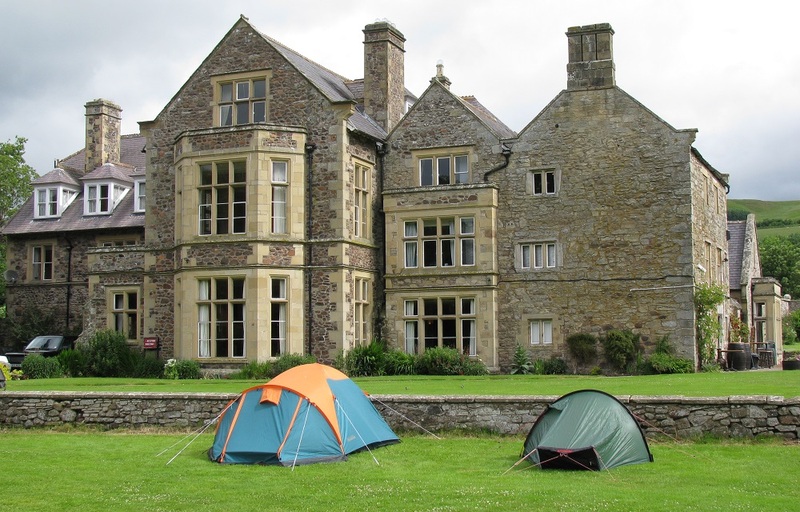 Clennell Hall is a fantastic place, previously a historic manor house, much extended by the Clennell family during their stewardship. There was plenty of room to park the H-Ds but some of the little tweety birds did their best to poop all over them. People came and went during the evening, for some beers and some tea. Some had more of the former than the latter and were looking a bit shaky on Saturday morning at breakfast. Rocky kept the beer flowing and we were never thirsty. Olwyn and John B shared the spoils with the domino cards. John kindly donated his to the Blood Bikes, who were the recipients of all the proceeds from the games. The hot water tank at Clennell Hall was knackered on Saturday, so many decided against a freezing shower before breakfast. 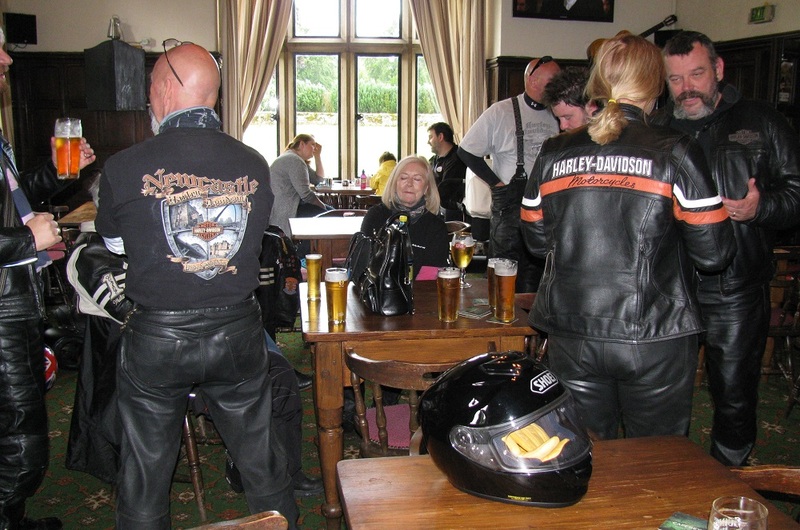 But breakfast itself was piping hot, so we filled our boots then got ready for our ride-out. Shaun led this and Badger looked after things at the back. There were ten bikes and one trike on the ride-out. Berwick-upon-Tweed was the destination and we had some impressive roads, dodging rain clouds all the way there. There was a lot of gravel and potholes on some of those roads, so we all took extra care. 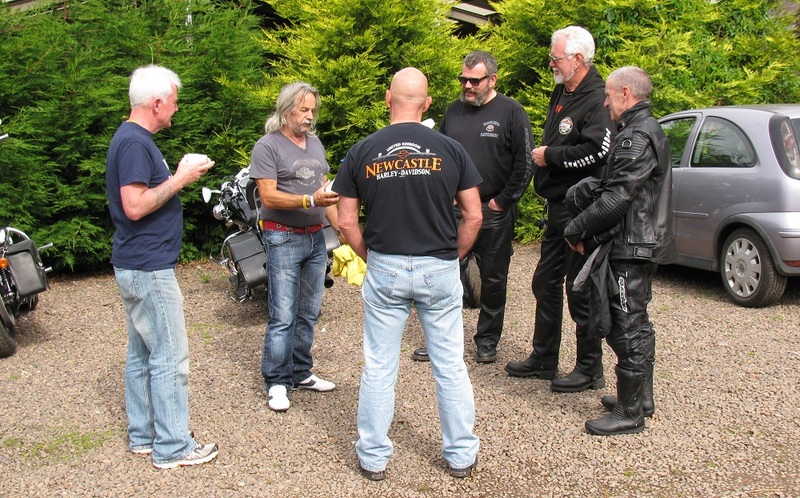 Powburn was the first stop for some fuel for the Sportys, then we headed north, past Chillingham Castle, then back to Wooler, Milfield and towards Coldstream before following the A698 and the River Tweed into Berwick. We got some fuel for the non-Sportys, and then headed into town to Castlegate car park. It was a fairly busy car park to start with but we managed to bring it to a standstill as we all found a place for our iron horses. 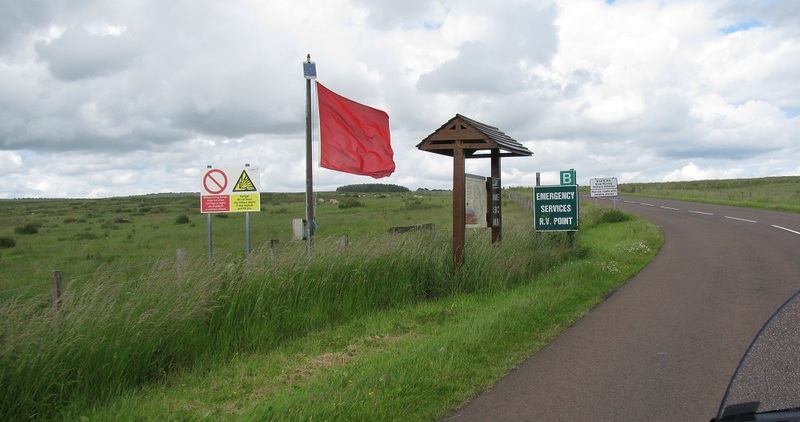 A very friendly man from the Council told us that parking is free for bikes throughout Northumberland. A wise idea. We spent a great hour or so in Berwick – the sun shone all the time we were there. Peter even enjoyed a fruit scone with clotted cream and jam at Caffe Nero! Time to get moving again and we were soon back on the A1, heading south towards Alnwick, via Bamburgh and Seahouses. You never really tire of riding these great Northumbrian roads with such beautiful scenery and amazing coastal landscapes. The rain caught up with us a couple of times but we shrugged it off as we chased the sun back to Alwinton. In and out of Alnwick, we hit the B6341 and retraced some of our steps, in the opposite direction, from the ABC ride last week, past Edlingham Castle again and crossing the A697 towards Cragside and Rothbury. There was a particularly vicious pothole that caught many of us just outside Alwinton but we all landed back safe and sound. A superb 110 miles, about five hours all told. 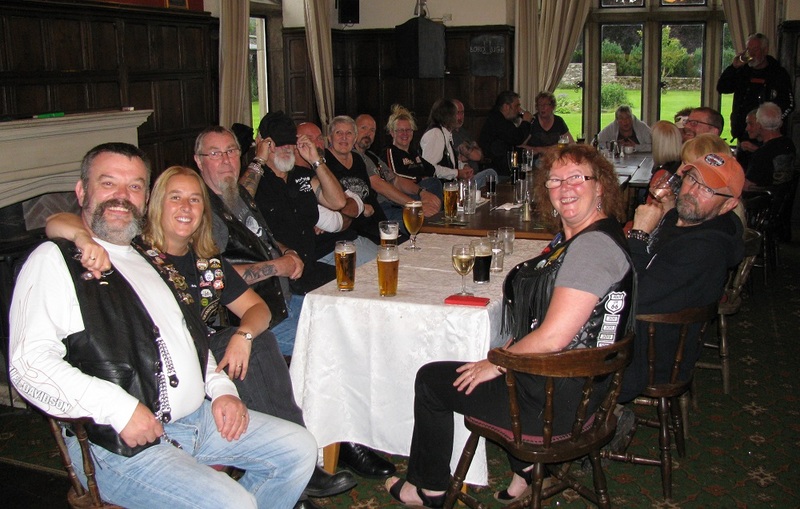 Some of our Saturday guests had already arrived, so we got back into beer and tea mode in Rocky’s Bar. Thankfully, the hot water tank was firing on all cylinders so we could all have a wash! 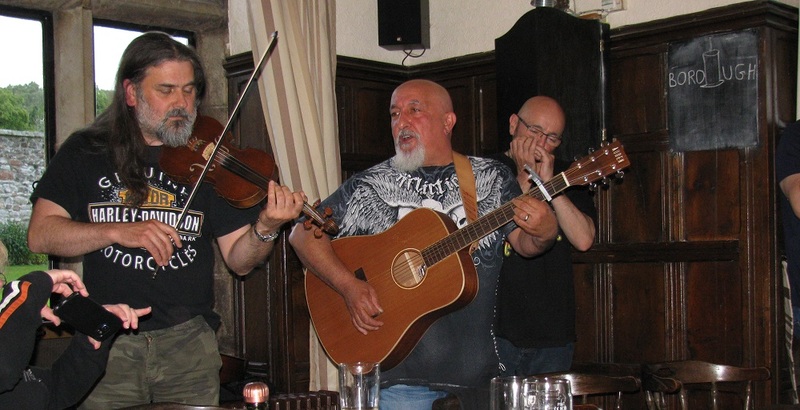 Simon and Stuart warmed up their strings and very soon we’d been through The Wagon Wheel and Copperhead Road. Steve helped where he could on either guitar or harmonica. Mark even managed a few chords for one song. A rousing quartet! 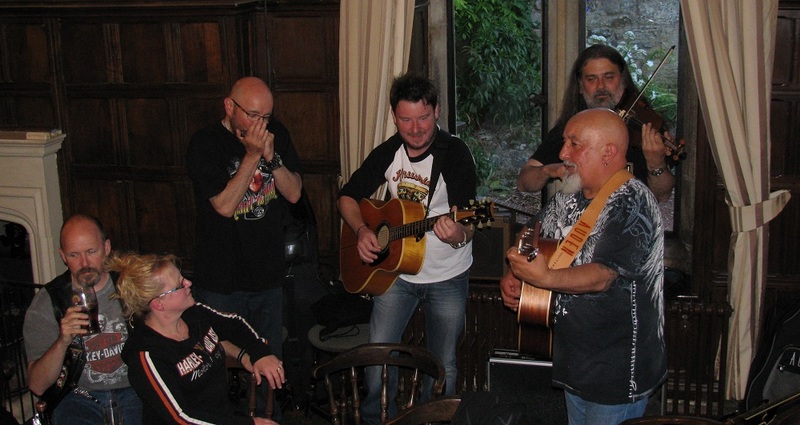 We had a few Bob Dylan moments too, with Knocking on Heaven’s Door and All Along the Watchtower. 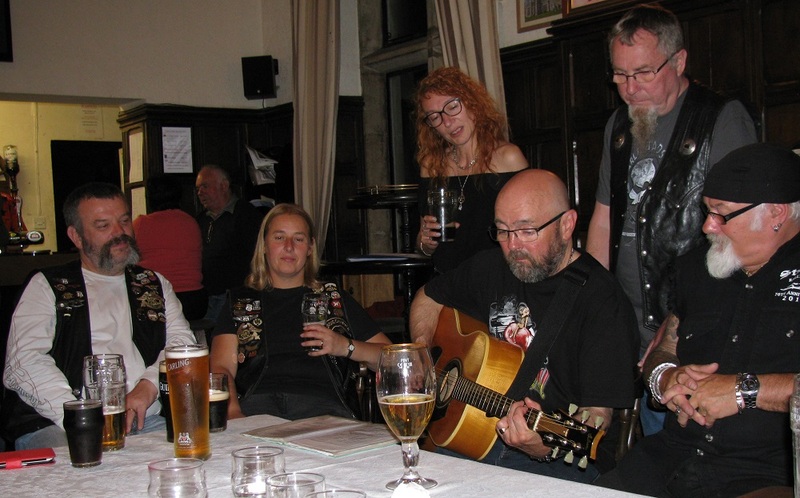 Everyone had a fantastic time: songs were sung, guitars were strummed, fiddles were fiddled and an amazing amount of beer was consumed. Phil even dazzled us with some foxy dance moves at one point too. The best thing though? It’s always the people that make it so great. 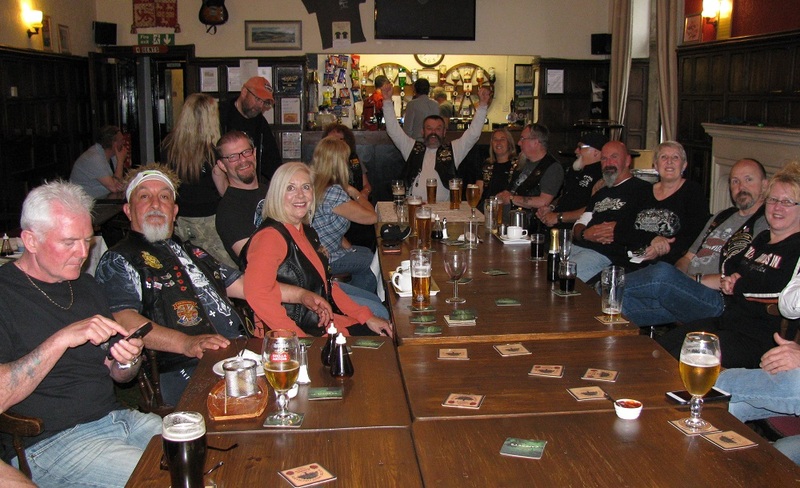 There’s no doubt Geordie Chapter are a very friendly bunch. All too soon, Sunday morning arrived and with more breakfasts eaten, we made our way home. 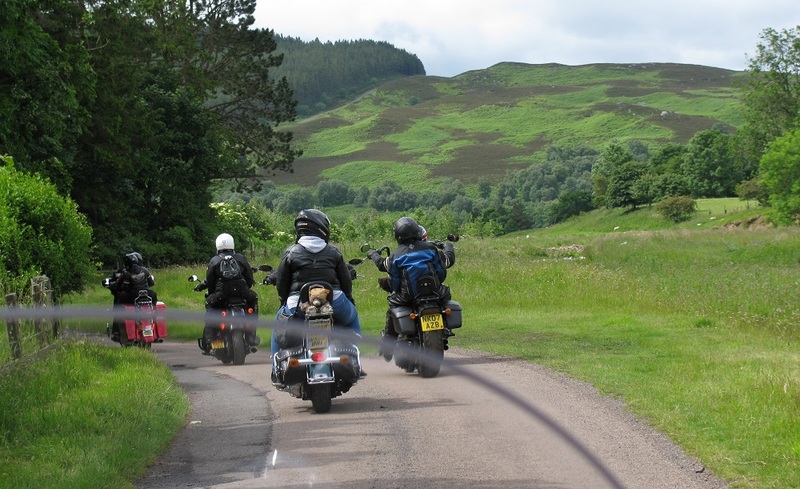 We travelled down with Paul and Donna, a lovely ride back after a great weekend away at Clennell Hall. Roll on next year! You can find our flickr album of photos here.